The California Academy of Sciences may be the world’s greenest museum, reports Joshua Davis, thanks in part to star chefs Charles Phan and Loretta Keller. 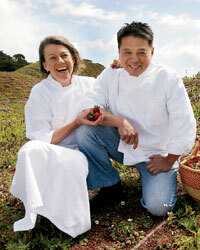 When Charles Phan and Loretta Keller need strawberries for a recipe, the two chefs behind the California Academy of Sciences in San Francisco don’t go out to the farmers’ market. They go up to the museum’s roof. The 1.7 million plants on the academy’s new “living” roof not only help insulate the building, they also provide ingredients for its café and restaurant, promoting the notion of cooking locally and sustainably in a way that’s radical even for San Francisco. That’s only one part of the academy’s vision. The roof, created during the building’s $488 million renovation, elegantly conceals one of the world’s largest planetariums, an aquarium with a coral reef system from the Philippines and a four-story glass dome filled with rain-forest plants and animals from Borneo, Madagascar, Costa Rica and the Amazon. From the front of the academy’s towering glass-walled entrance, it looks as if someone lifted the earth up 65 feet and slid a museum inside. The camouflage blends perfectly into the academy’s setting in Golden Gate Park, but it’s not a gimmick. Star architect Renzo Piano—the designer of Paris’s Centre Pompidou—has turned the museum into what will be the largest public building to receive a LEED Platinum certification, indicating that it meets the highest possible level of environmentally sustainable design. Sixty-thousand photovoltaic cells cover the exterior, generating about 10 percent of the building’s energy. To provide insulation, the walls are stuffed with shredded denim salvaged from the floors of jeans factories. As a result of these innovations, the academy doesn’t need air-conditioning. “You can’t put a regular museum cafeteria into a building this amazing,” says Charles Phan, executive chef and owner of the Slanted Door, San Francisco’s vaunted Vietnamese restaurant. Two years ago, the academy’s board of directors asked Phan and his good friend Loretta Keller, the chef and owner of Coco500, to develop dining ideas that would complement Piano’s message of environmental sustainability. They’ve responded with two restaurants that embrace the building’s eco-friendly ethos. The Academy Café, on the main floor, feels like an interactive exhibit showcasing cuisines from the Mediterranean, Southeast Asia and Mexico. While the museum’s scientists were traveling the planet collecting plant and animal specimens, Phan embarked on his own international culinary investigations—for example, flying to Guadalajara, Mexico, to eat at the city’s roadside taco stands. The research yielded two key discoveries, both in evidence at the museum’s café: Taco meat is always better braised, and grilling two tortillas together prevents them from getting soggy. At the café’s noodle station, visitors can try Phan’s signature Vietnamese dishes, like a ginger-infused lemongrass pork with vermicelli. The pork is served in a Thai chile–spiked brown-sugar sauce, leaving the meat juicy and sweet. At the back of the café, a mysterious staircase descends along a wall covered in moss (which cleans the air and dampens noise), leading to the ambitious Moss Room. Walking down the stairs to the restaurant feels like entering a forest where Asian river fish dart through an illuminated aquarium tank, casting flickering shadows. Even small details advance the eco-mission: Wooden tables are bare—tablecloths require energy and water to wash—and a number of dishes are cooked and served in clay bowls, reducing the number of pots and pans that need cleaning. The Moss Room emphasizes the chefs’ commitment to local purveyors. Incredible Bay Area ingredients transform deceptively simple dishes. Keller’s crunchy brussels sprout salad tossed with sautéed apple slices, ham and tangy, caramelized goat cheese is a perfect example. The salad is terrific with an earthy 2006 Peay Vineyards Pomarium Estate Sonoma Coast Pinot Noir from the Moss Room’s 3,500-bottle, biodynamic-and-organic-focused wine cellar. Just outside of the restaurant, an exhibit on climate change in California has a not-so-subtle point: We can make better choices. Phan and Keller are demonstrating that those choices can also taste great. The California Academy of Sciences, including the Moss Room and Academy Café, opens September 27. calacademy.org. Joshua Davis is the author of The Underdog and a contributing editor at Wired magazine.